This morning, I ran the Brazen Racing Bay Breeze 10k. As with all Brazen races I’ve run, the event was well organized, staffed with awesome volunteers, and run like a race should be…and on time too! Proof that Brazen knows how to “put ’em on” was that each race at the event (half marathon/10K/5K) was completely sold out (547/513/536 respectively). Needless to say, the place was busy. 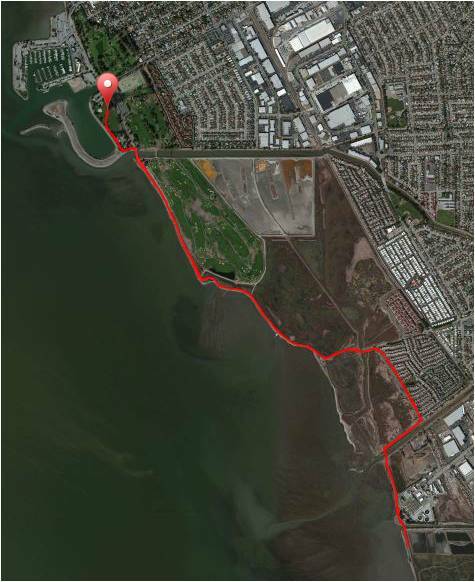 The 10K (and all races, for that matter) were nice, flat out and back courses that started at the San Leandro Marina Park and headed out along the shoreline. As I was sharing the “running along the shoreline with the waves crashing” story with Karen after I got home, it dawned on me – I only recall hearing/appreciating it for a short distance. I think I got in a zone and blocked out most everything else. Weather wise, it was a little cool; nothing new for me since I normally run at 0430 anyway. All in all, a great weather day for a run. I was glad the rain predicted earlier in the week ended up not happening. The post-race, food-a-palooza was packed (the picture below was just after I finished my run – it got a lot more crowded), so I grabbed some water, waited for the results, and then headed home. This was actually my first “official” 10K – though my long runs are already an average of 12 to 21K. I’ve been intentionally building base and limiting the organized runs to incremental distances (no matter how tempting it is to register for a half marathon at this point.) 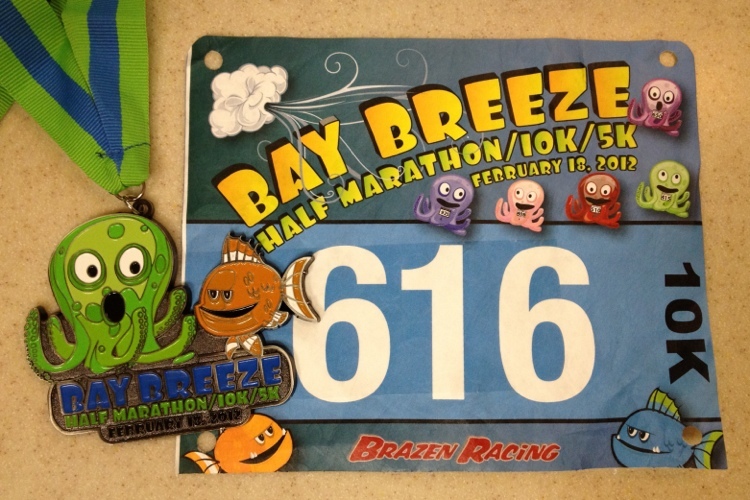 Bay Breeze marked the progression from 5 to 10K…all leading toward my first marathon in December! It’s funny, all week I planned my pacing strategy for ending up with a sub-60 minute 10K: 9:25/9:20/9:10/9:00/8:30/8:30/8:00=56:55. Out of the starting area I told myself, “you’re too fast, once you get out of the crowd, settle in at the planned 9:25” – oh well, so much for listening to myself! The race ending up being a fast tempo run, albeit about a minute faster than I normally “tempo.” Bottom line, I tempo’d my way to my goal of a sub-60 and ended up 3:25 better. While I’m happy with my time (as I should be! ), I feel like I made my “kick” too late and could/should have done it sooner – I had the energy and probably could have done it at mile 4 or 5. Next time, next time. Bummer: Neither my foot pod nor my heart rate monitor worked this morning…my Garmin wouldn’t even detect them. I’m wondering if the batteries are dead… Not a big deal for this morning, but a bummer none the less. Laugh: I averted a possible “wardrobe malfunction.” As I made my final potty break before the race, the drawstring on my running pants broke…and came all the way out of the pants. All I could think while I was running was I hope my rear’s not showing! I never heard anyone laugh, saw people pointing, or parents shielding their children’s eyes, so I must have been OK. The “forget”: In the starting pen, I remembered that I didn’t eat the GU Chomps I brought with me! Maybe I just psychologically need them, though I do believe they serve a purpose. I did have my electrolyte brew in hand, so it wasn’t a total forget. Still, I may have shaved some time off if I’d eaten them – probably not! Garmin time: 53:30 at an 8:38/mile pace. Official time: 53:27 at an 8:36/mile pace. All in all a good run – even with my “could have done better” whine. Post race meal: Big Mac Extra Value Meal, baby!!! 408K Race to the Row on March 11. Emerald Across The Bay 12K on March 18. As far as training plans go, since I have a series of runs in short succession over the next few months and I will be starting a half marathon plan in May, I’m using the final weeks of the 10K plan I’ve been using, upping the mileage slightly to ensure a necessary base for the various runs on the calendar – sorta my own “bridge to” plan. And yes, you did read the word “MARATHON” above. I am planning on running my first marathon on December 9: The 40th Honolulu Marathon…ALOHA! Training for that starts August 6!